The Summit is an intensive academic program with AICL’s traditional focus on hands-on projects and fun lessons for high school students. As always, we encourage students to explore areas outside their usual academic strengths if they wish, but classes are designed to challenge and prepare students for college. 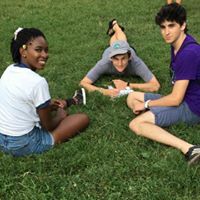 Campers at The Summit will have some loosely structured time in the evenings to explore the concepts and skills they learn in class and campers will take a more active part in the planning and execution of camp activities. This is a residential program for campers rising 9th to 12th grades. Mars Hill University, North of Asheville, NC. For more information, check out Mars Hill’s website!